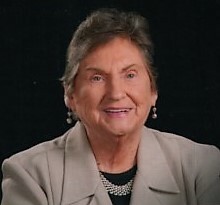 Ann Hancock Felker, 89, entered eternal peace on Wednesday, November 21, 2018, surrounded by her loving family and friends of Lakeview Manor Community. Ann was born January 9, 1929 in Atlanta, GA to the late Rev. Buren Wesley Hancock and Mary Lucille Lawhon Hancock. She graduated from Girls High School in Atlanta in 1947. After high school she started night classes in college while working at the phone company until she got married on November 19, 1949 to the love of her life Norman S. Felker. Ann was an active member of the Methodist Church all of her life and involved in every aspect of the church. Ann was preceded in death by her husband, Norman Felker; parents, Rev. Buren Wesley Hancock and Mary Lucille Lawhon Hancock; and beloved sister and brother in law, Joyce Floyd and Rev. W.R. Floyd. She is survived by: her sons, Dr. Stephen A. Felker (Linda) of Columbus, GA, David S. Felker (Jeanne) of Springfield, and John M. Felker (Connie) of Savannah; grandchildren, Ryan Felker of Rincon, Mary Rewis (John) of Guyton, Sydney Ross (Rob) of Athens, Adrienne Birge of Virginia, and Alexa Wilson of Columbus; 5 great grandchildren, Harlee and Haleigh Rewis, Jacob Felker, Jonathan Rewis, Coraline Ross and several nieces and nephews. Visitation will be held at Rincon United Methodist Church on Monday, November 26, 2018, from 10am-11am with funeral services to follow at 11am. Interment will be held in the Rincon Cemetery. The family suggest any remembrances be made in her memory to the The Methodist Home for Children and Youth, P.O. Box 2525 Macon, Georgia 31204.